This wristband by sports brand Nike tracks your movement throughout the day and gives you points for being more active. 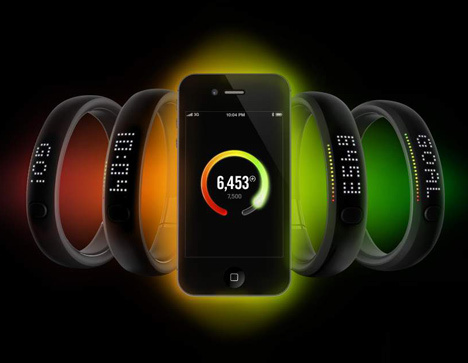 The FuelBand uses an accelerometer to measure activity plus algorithms to allow for different types of movement, resulting in an index of points called NikeFuel that everyone can earn regardless of what exercise they do. 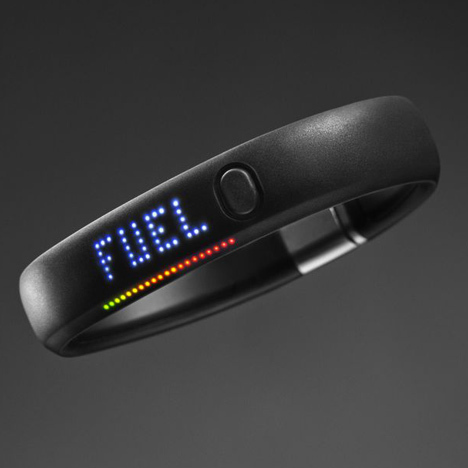 The LED display counts NikeFuel in realtime and can also display calories, steps or the time. A strip of 20 LEDS along the edge change from red to green as the wearer approaches their daily goal. The band can sync by UBS with the Nike+ website or wirelessly with a mobile phone app so users can analyse their progress, compare scores with others regardless of what sport they do and share via social networks. Electronics brand Jawbone launched a similar product last year but theirs was criticised because it didn’t give feedback in realtime and had to be plugged in before users could access the data it was collecting. The curved lithium batteries in Nike’s design allow it to power the LEDs for instant feedback but it can still only register activities that involve arm movements. NIKE, Inc. announced today the NIKE+ FuelBand, an innovative wristband that tracks and measures everyday movement to motivate and inspire people to be more active. Activities can now be measured through a new metric called NikeFuel: the more active you are, the more NikeFuel you earn. NIKE, Inc. President & CEO Mark Parker unveiled NIKE+ FuelBand at an event in New York attended by seven-time Tour de France champion Lance Armstrong, Oklahoma City scoring champion and all-star Kevin Durant and 2011 IAAF women’s 100-meter World Champion Carmelita Jeter. Designed to be worn throughout the day, the ergonomic, user-friendly NIKE+ FuelBand uses accelerometry to provide information about different activities through movement of the wrist via a LED dot matrix display. 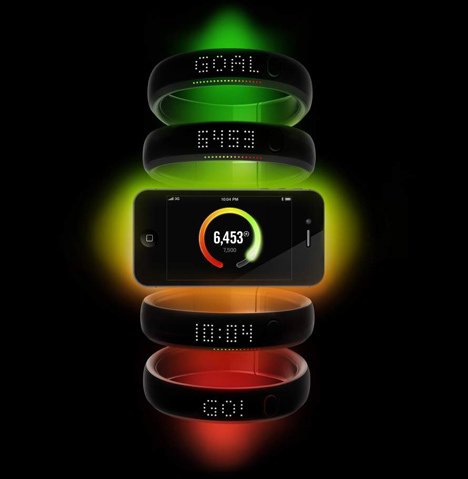 Four metrics are available: Time, Calories, Steps and NikeFuel. Unlike calorie counts, which vary based on someone’s gender and body type, NikeFuel is a normalized score that awards equal points for the same activity regardless of physical makeup. Users set a daily goal of how active they want to be, and how much NikeFuel they want to achieve. 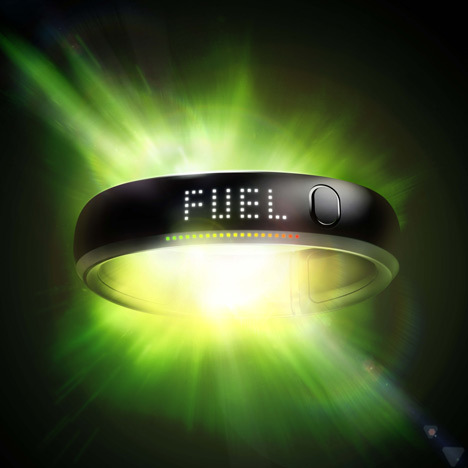 The NIKE+ FuelBand displays a series of 20 LED lights that go from red-to-green as the user gets closer to their goal. The FuelBand syncs with the Nike+ website through a built-in USB, or wirelessly through Bluetooth to a free iPhone app, to record activity and track progress every day. The app interface also provides encouragement and motivation as goals are achieved. Jeter said, “You don’t have to be an elite athlete to appreciate how NikeFuel can motivate you. It’s an easy way to get credit for activities and compare how you do with others, even if you take part in different sports. This entry was posted in strategy, technology and tagged Carmelita Jeter, iPhone, Kevin Durant, Light-emitting diode, Mark Parker, NIKE, NikeFuel, USB by dimitri seneca snowden. Bookmark the permalink.